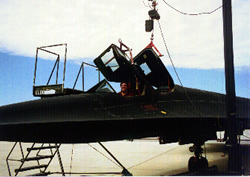 When I first inspected our Blackbird at Edwards Air Force base back in July her rudders weren't attached. This was somewhat alarming because you want to exhibit a complete aircraft. Every kind of spare was being hoarded to keep the remaining Blackbirds aloft and even I agreed with that thinking. 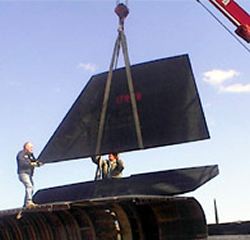 However, it would present an interesting challenge to fabricate replacement rudders. Happily, both our rudders were available and secured in a hangar protected from the birds. Even better both still had the correct tail numbers in crisp red letters. It was not unknown during the United States Air Force's operation of the Blackbird fleet to physically switch out the rudders from bird to bird as a means of disinformation. This served to confuse those whose interests were not sympathetic with the United States to thestill-secret capabilities of the Blackbird fleet. With the inner wings and nacelles attached the next step was to uncover the rudders and crane each one into position. Worldwide Aircraft Recovery has a portable crane mounted behind the cab on the Kenworth tractor and the crew carefully walked each rudder to the rear of the aircraft and then craned them up to their mounting points. Now secured, the Blackbird looks like an aircraft again. Work still remains. Skin over the engineered splice neds to be reattached, elevons mounted, gear doors reattached and a good cleaning. The October 30th dedication date draws ever closer. With the outer wings and nacelles reattached it was time to move the Blackbird to her temporary home on pads in front of the museum. Thanks to advice and support of the Virginia Air National Guard we had the landing gear ready for the pads. We were fortunate to have picked up a Blackbird specific towbar in California and this was attached to the nose gear. We walked the approach to the pads for FOD (foreign object debris). We weren't worried about ingesting any FOD in the engines we don't have but we didn't want to lose any tires during the short tow. The FOD walk also showed us the specific areas of the parking lot and curb and lawn we would be passing over. Since I first left in July central Virginia had come out of an extended drought into an unusual monsoon season plus brushes by two tropical storms. Richmond International Airport is built upon White Oak Swamp which stymied General George MaClellan during the War Between The States. We didn't want that to happen to us. Worldwide Aircraft Recovery reached into their bag of tricks and pulled out enough metal planking and blocks to make any member of the Army Corps of Engineers proud. Using the big Kenworth as a tug the Blackbird started its slow roll to the exhibit stands. Metal Planks and wood blocks gave a good rolling surface and the Blackbird rolled bit by bit into and up out of the front parking lot. Just 20 feet short of the cement pads the left main gear left its plank and got part way into the yard. Careful work, judicious use of strapping and "magic" saw the Blackbird gently on to the cement pads. From there it was putting away the equipment for the night and planning for the lowering of the wings and the securing of all assemblies. Wednesday would be the last day of the reassembly. With Blackbird 6-17968 safely parked on her temporary cement pads we can now step back and take stock of where we have been, where we are and where we are going. The Virginia Aviation Museum has always been one of the best, if underinterpreted, collections of Golden Years of Aviation aircraft in the world. Our Blackbird signals an expansion of our mission and direction. We have much left to do in the growth and interpretation of the Golden Years between the two World Wars but we have an even larger mission to plan for now. Presently we are laying out the groundwork for a museum four times its present size that will cover Virginia aviation from the first balloon ascent in Williamsburg in the 1700s to the joint civilian-NASA operation of the rocket launch facility at Wallops Island. What we are doing now is laying the groundwork to take this facility and its exhibits into the 21st Century. Besides historic objects this new exhibitry will include interactives to help illustrate the science behind this history. To grow the museum we hired our first Executive Director Mike Boehme who will oversee all facets of this expansion. We plan to exhibit all aspects of aviation within our new facility and not only cover the history but to also spend more time than most museums explaining the science behind that history. Virginia's history is long in this department. Civil War balloons lofted from a site near this museum in the early 1860s. NASA started in the Commonwealth in 1916 as the National Advisory Committee on Aeronautics. Military aviation and its related technologies in the Commonwealth goes back to the Wright brothers selling the United States Army its first aircraft after successfully demonstrating it at Fort Myers, in 1909. The fledgling aviators of the United States Navy started and continue to grow the tradition of carrier aviation at Hampton Roads, Virginia. The stories are long, varied, interesting and continue to this day. Our Blackbird while not based in Virginia during its operational days is now based out of the Virginia Aviation Museum on a different, still important, operational mission. It now serves as a monument to both the history of flight and the science behind it and also as an ongoing inspiration to flight and science yet to be discovered. Its dedication this past Saturday drew the kind of attendance and interest we are only now starting to mine to expand the museum. As I watched the visitors admire the Blackbird and interact with visiting SR-71 crew that included Tom Alison, Curt Osterheld, Joe Kinego and I knew I had witnessed the end of one era of this museum and the beginning of another.